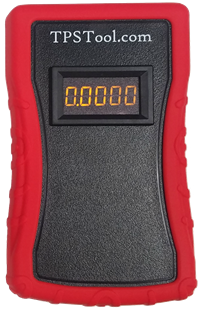 Resolve most popping, stumbling, and flameouts while improving throttle response, in minutes! By fine tuning your Throttle Position Sensor (TPS). Includes any 1 adapter cable, see plug styles below. Additional adapters available separately. 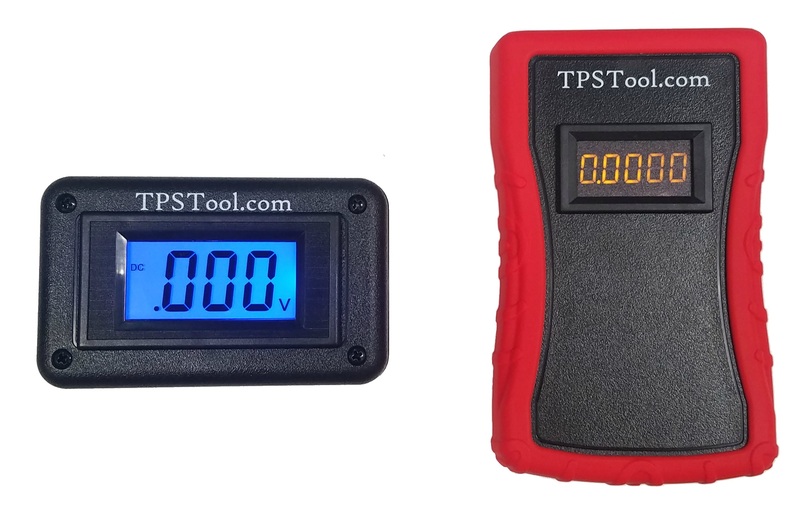 Measures from 0-5V, perfect for setting and tweaking the TPS voltage, PLUS evaluating TPS performance from idle to full throttle for diagnosing TPS sensor faults. See Our Review On ThumperTalk.com! Q: How can I get in touch with you directly? Q: Can I talk to other customers to ask about their experiences with this tool? A: Yes please do! Click here to join the discussion on the ThumperTalk.com message forum. Q: Why is adjusting my TPS necessary? A: To improve performance! Smoother running, reduce or eliminate flame outs, easier starting and better throttle response. A: This works for 2 reasons. First, due to manufacturing tolerances, all throttle bodies are not absolutely identical. 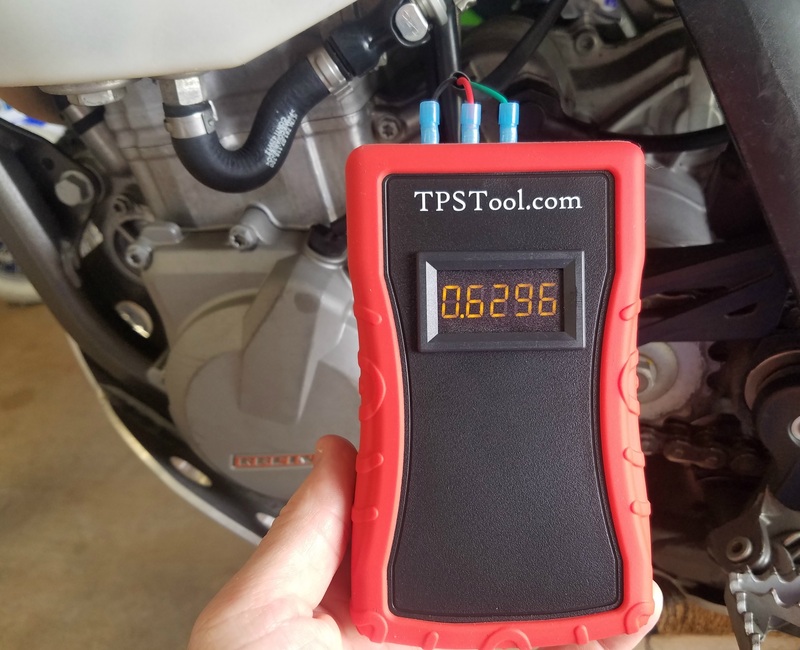 Some let through slightly more air than others, and adjusting the TPS voltage allows you to find the value that gives you the best result for your specific throttle body. Second, some models such as the KTM EXC models come with excessively lean fuel maps that can lead to misfiring, stumbling and flame outs at small throttle openings. 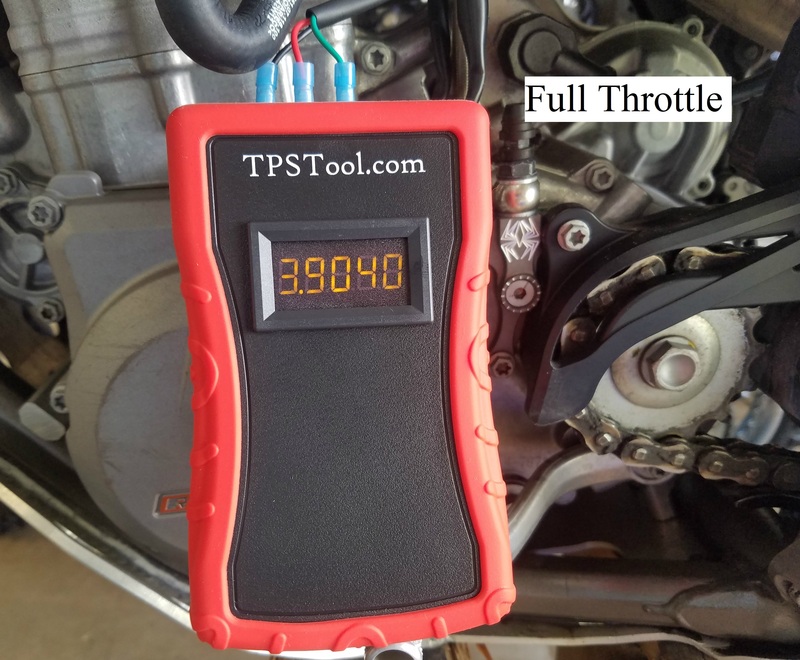 Raising the TPS voltage slightly increases fueling resulting in reduced flame outs and a significant improvement in smoothness and performance, especially at small throttle openings. Q: Is this really as simple as it sounds? A: Yes, TPS adjustments are very simple! Simply increase the voltage .02v and test. If it's better, increase another .02v. Continue as long as you see improvement. If you do not see an improvement, go back .02v. You should find your perfect setting very quickly. Q: How are these shipped? A: US Mail, with tracking. Tracking number will show in your PayPal account. Q: How long does it take to be delivered? A: West coast USA orders usually arrive in 2-4 days. East coast USA orders usually arrive in 3-5 days. International orders vary by country. Most international orders are delivered in 1-3 weeks. South Africa takes several weeks. Q: Is this an accurate way to set your TPS? A: Yes, extremely accurate. 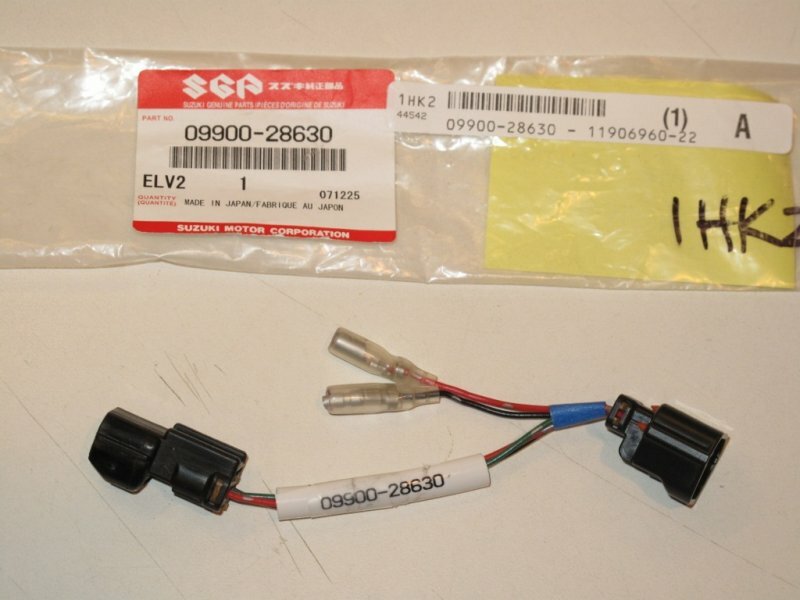 Suzuki actually provides a tool for their dealers that works in exactly the same way, Suzuki, part number 09900-28630 shown here. Q: What models does it work on? A: Any bike that has a TPS plug matching one of the pictures above. 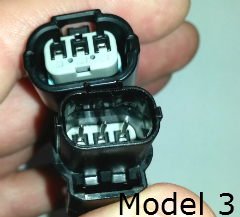 Compare your TPS plug to the pictures, and whichever model matches your plug is the model that you need. Contact us if you have any questions. Q: What do I set my meter to? A: Set your meter to DC Volts. Choose the mV setting if your meter has the option. DO NOT set your meter to DC current (amperage)! Q: My bike does not have a key, will it work? A: Yes! Either bump the start button briefly, this will cause the TPS system to power-up for approximately 8 seconds (starting the motor is not necessary), or start the motor and take your time. For kick-start-only bikes, simply start the motor. Q: My bike is not electric start, will it work? A: Yes, just start the motor and let it idle while measuring and adjusting. A: Yes, lifetime warranty for the original purchaser. Q: Do I need an external power supply? Q: Will this work on non-KTM bikes? A: YES! 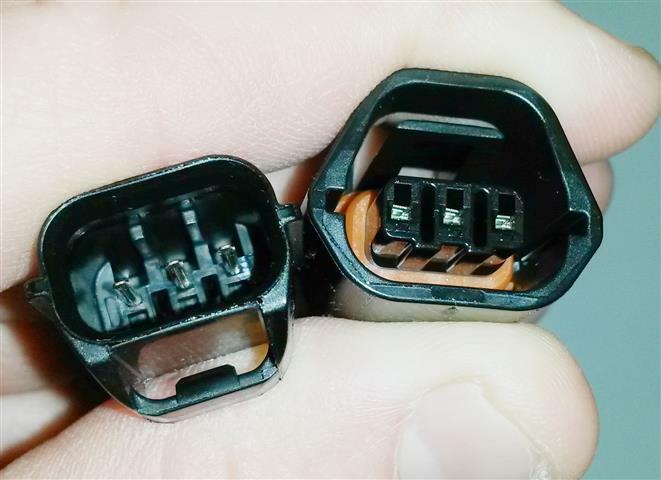 Unplug your TPS and look at the connector. Simply match your connector to one of the pictures above. Q: Where do I find the GPS map of the Croom Motorcycle Area? Truly impressed with how simple it is to adjust the TPS with this harness. Great product and customer service!!! I also just got the TPStool for my [ktm 450sxf]. Mine was set at .49 from the factory and after I installed a fmf 4.1 slip on it popped like crazy. The tps tool was perfect!, Hooked it up and bumped it up to .51 and popping is gone. And it seems to have more power aswell. For me its a great buy simply because its easy to use and you can be accurate with your settings. Just wanted to leave some feedback on the tps adjustment tool. I have a 350 EXC-F with no mods to improve the performance. ...... When I took the first reading (stock), it was at 0.59. I changed it to 0.61 and wow, the difference is night and day on my bike. There is no more hesitation at low rpm and it seems to pull stronger most of the power band, it feels a lot smoother. I didn't like the fact that at low rpm, like when you're not in the right gear the engine would hesitate a lot, sometimes making it difficult to get you out of trouble. This absolutely fixed it. I highly recommend, this is easy and cheap to buy. Took me about 5 minutes to do the change. 500EXC Was at.58 set it to .64 idle speed went up a little. I have done several rides. Stock pipe, de-smog, I don't need anything more, runs great. TOOL WORKS GREAT!!! THANKS!!! Your tool is great [Matt]. Thanks for all the info you have passed on. I tired .64 and it ran much better. I just did mine today. 2014 350 exc-f with only exhaust screen pulled. It started popping after I pulled the screen. My factory setting was .58 and I went to .64, I get better response now, and less popping…..
…...time for the TPS tool. Installed tool and did measurements...0.574v was stock setting TPS. All TPS adjustments done when the motor was cold. Loosen screw and set it at 0.649v...road test again no seat of the pants difference but could smell it was rich (I'm at 4000ft elev- in the high desert ). So I took it down to 0.625v.... road test..OMG the thing came ALIVE!. Low end grunt better and the top end is insane...came up to 80mph and its still pulling. All around the power is noticeably better……. I bought a 2014 KTM 500 EXC and rode around about 20 hours with the smog stuff intact. Pop on decel was pretty bad. I blocked off the incoming air to the exhaust air control valve, thinking that might help a bit, but and the popping continued. I was trying to see what the minimum changes I could do I order to "stop the pop". I have to give [Matt] praise. He goes above and beyond in his customer support with the TPS Tool. I had an issue that he patiently walked me through. 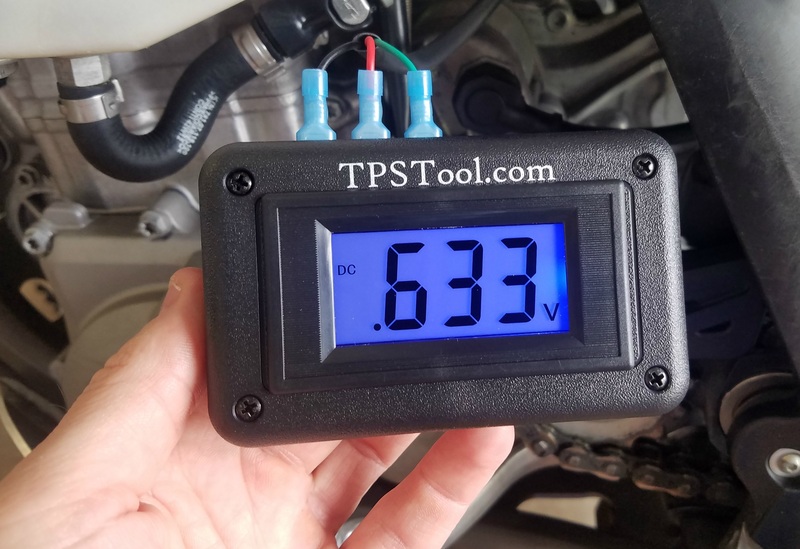 Just received my tps tool, so I drilled out my screen, adjusted tps from .61 to .65 and no more hesitation, no more popping on decel, super smooth throttle response. Easy to keep throttle at a constant speed now. Bike was already desmogged, so this is all from just the tps and drilling screen out. They should include this tool when you buy your bike! The throttle response is great after adjusting the Tps. It wasn't about more power for me. I now have crisp throttle response. No slack whatsoever. 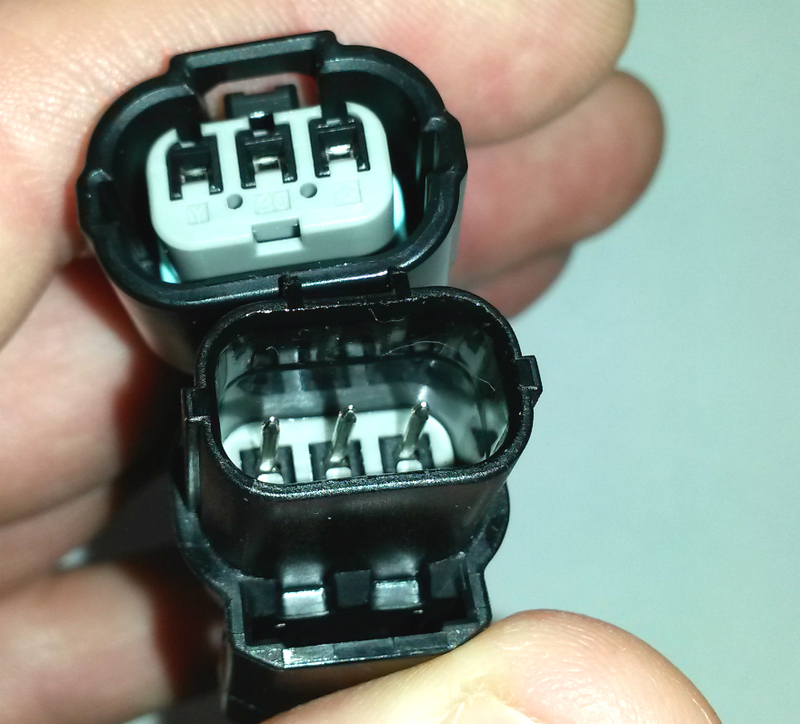 …….as far as the tps wiring tool, its a must have item! you'll use it through out the bikes life to ensure the right setting is maintained. I need to give an additional glowing recommendation for the TPS tool. Big thanks [Matt]. ......... It took me longer to take off the seat and the tank then to adjust the TPS sensor. TPS was at factory .582v. The best I could get was .642v. As others have stated "very sensative." ……. .62 seems to be a good spot for tps on the '14 500xcw. No screwy idle problems, quick starting, clean power delivery, few to no flame outs. Adjusted tps to .64 from stock .58 better, tried it at .66 and awesome definitely best mod for money completely different throttle response now awesome! Bike is still doing great. Thanks for a great product! So nice not to have any more flame outs. I have to start this off by giving a BIGGGGGGGGGGGGGGGGGG Thank you to [Matt]! As he gave me the utmost customer service with this purchase and ensuing shipment…………. …….. set tps to .64.. it is night and day difference feels like a different bike. Way more torque and better throttle response. Well worth the money! Sounds 10 times better without all the popping ………..
tillamook national forest in oregon coast....4 rides at .579 volts..1 ride last weekend with TPS now set to .638. Rides slower trails better since i moved tps and increased rpms. fan still came on but i was trying to blow up hills out there. but in general it didn't stall, an seemed to start ez'er after warmed up! Finally had a chance to hook up the tps tool and give er a test. Factor setting was like everyone else at 0.585. Adjusted it to 0.628 and went for a rip down the street. First off it started much better, idled maybe a hair higher but that's minor. The big change was off idle throttle response. Incredible difference! No bog or hesitation what so ever. Just crispy and quick. …………………….Thanks a million for the simple but necessary tool!